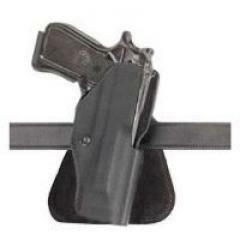 Compact, lightweight and convenient holster, the Safariland 5181 is specially designed for the unique needs of selected pistols. Adjust the tension device to your liking for a customized feel when drawing. The Safariland 5181's thermal molded self locking paddle allows for easy placement and removal of the holster. No belt is necessary. Soft suede lining and built in gun sight protection complete the package. Known around the world for their law enforcement products, Safariland is taking the knowledge gained to manufacturer holsters and accessories into the civilian market.